LONG LASTING POWER FROM TENERGY. OPTIMAL POWER – For your everyday devices. RELIABLE PERFORMANCE AT EXTREME TEMPERATURES -4°F to 129°F degrees. HOLDS POWER FOR UP TO 5 YEARS ON THE SHELF. DATE CODED TO GUARANTEE FRESHNESS. 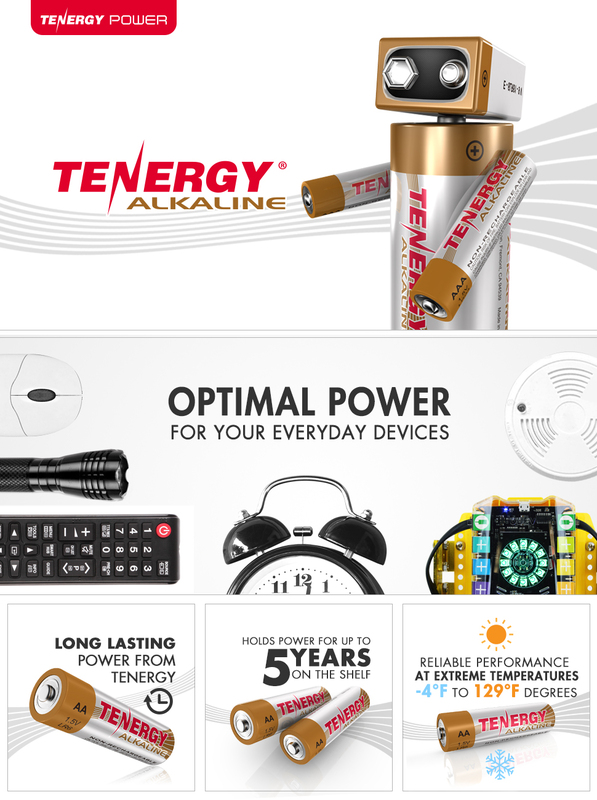 LONG LASTING POWER - With a 12-piece LR20 alkaline D battery pack, Tenergy gives you the best value for batteries at an affordable cost. Long lasting and high performing, these D size batteries will go the distance for all your electrical needs. Stock up and keep your electronic devices ready to go, never worry about dead-battery problems again. POWER HOUSEHOLD ELECTRONICS - A performance you can count on, our batteries function as the best household alkaline D battery to power your electronics. Best used on everyday applications such as flashlights, baby swings, baby cradles, radios, stereos, emergency lamps, electric candles, security lights, and much more! RELIABLE PERFORMANCE - Even at temperatures as low as -4°F degrees or as high as 129°F degrees, the Tenergy 1.5V D battery will still operate at optimal performance. Rest assured knowing that Tenergy stands behind the performance of our batteries. 5-YEAR SHELF LIFE & DATE CODED - In emergency situations you don’t want to be without energy when you need it most. Our long lasting D alkaline battery provides up to a 5 years shelf life for trustworthy backup energy, so you’re always prepared. All our alkaline batteries have been date coded to guarantee freshness. SAFETY CERTIFIED - Our D size battery alkaline has been held to the strict requirements by RoHS (Restriction of Hazardous Substances). With a certificate by SGS under the standards of IEC60086, it has passed the all encompassing battery testing from performance, dimensions and environmental factors. WARNING: These are one time use disposable batteries. Please DO NOT recharge these batteries. NON RECHARGEABLE BATTERY! CANNOT BE CHARGED! ONE-TIME USE BATTERY. Risk of fire. Battery can explode or leak and cause injury if installed backwards, disassembled, charged, crushed or exposed to fire or high temperature. Do not put the battery into a charger of any kind. Cannot be used with other types of batteries together. Charging this battery may cause leaking, damage to battery/charger, or lead to fires.